National 5th June 2017: Brand Factory, India’s leading fashion discount chain, a part of Future Lifestyle Fashion Limited celebrates 10 years of great discounts by announcing flat 50% off on everything for everyone valid from 7th to 11th June. Launched in October 2006 with its first store in Marthahalli - Bangalore, Brand Factory today has 55 stores present across the country generating revenue more than 1200 cr. In addition to flat 50% discount on all brands, consumers will get gift vouchers worth Rs. 1000 on every bill of 10 items. Making it a super value deal, on every bill of Rs. 2000 customers will get vouchers of Rs. 2000. Not only this, customers with a birth date of 10th of any month can purchase Converse Slippers worth Rs. 499 at Rs. 99 only. Students who have given their 10th standard exams this year can purchase stylish Umbro T-shirts worth up to Rs. 699 at Rs. 99 only. 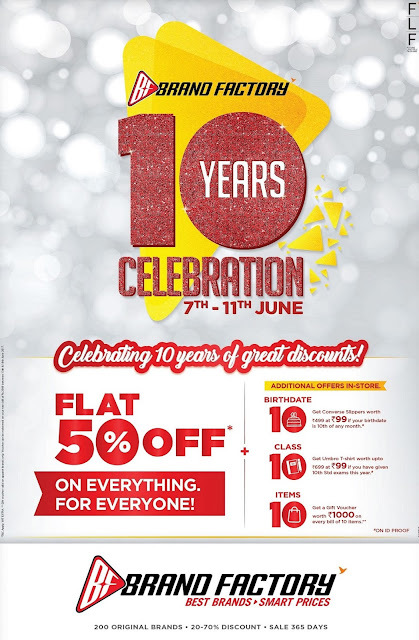 Brand Factory’s 10 year celebration sale is from 7th to 11th June across all Brand Factory outlets in the country.